Masonry is the art of adding hardscape elements to a landscape in order to balance its appeal and function. Although a landscape with many lush plants and trees looks absolutely stunning, the addition of hardscape enhances it further and provides a solid edge and design to it. With masonry, the monotonous theme of a landscape can be addressed dramatically. We at Four Seasons Landscape Management can transform your garden or landscape into a balanced haven of serenity, regardless of what theme or concept you want it to portray. We can provide you with unique and creative designs, or, if you have one in mind, we can help you make it a reality. Walkways - These are very important parts of outdoor areas because they make homeowners and guests walk around their landscapes safely and conveniently. Driveways – They provide easy and convenient spaces for driving in and out of your property, while also enhancing its physical appeal. Patios – They provide extra or extended living spaces for entertainment, recreation, or relaxation. 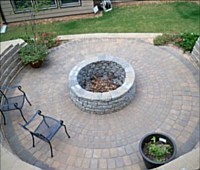 Fire Features - Whether you prefer a fireplace or a fire pit, masonry can make it look beautiful without compromising its functionality. Retaining Walls - Probably one of the most functional types of masonry works, retaining walls are designed and built beautifully while they keep soil and slopes in order. Pool Decks - A pool, no matter how big or small, will look even more attractive with a well-designed deck around it. What Makes Us the Best Choice for Masonry Works? When it comes to choosing reliable masonry services, it is important to check the company and the employees that work for them. Our team of masons is certified and licensed to work in the state of Georgia. Although a license is not a requirement, it keeps you protected under the law in case you are not satisfied with a particular project. Along with a license and experience is our ability to use tools and operate equipment meant for these kinds of project. We offer you all these and more, so you can be rest assured that you get the best service from start to finish. Our experienced masons have handled both residential and commercial projects which make them more versatile and work with utmost efficiency. If you are interested in enhancing your outdoors by adding creative and durable hardscape elements, pick up your phone and give us a call now.